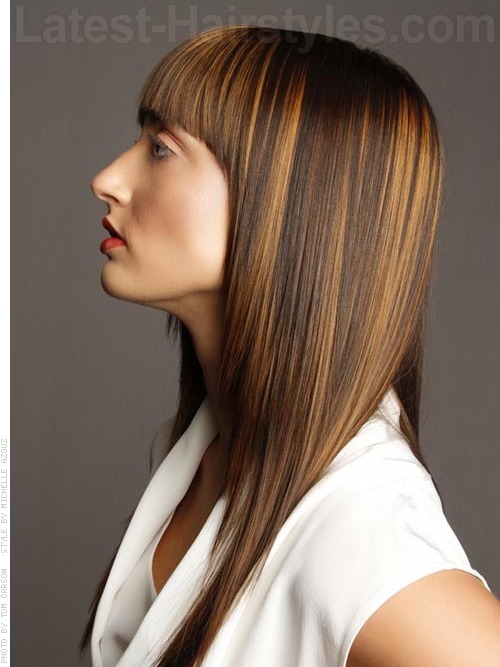 Long sleek hairstyles provide great opportunities to play with bold color placement and shades. The right amount of highlights and low-lights can create outstanding movement and depth to your texture. Be sure to try anti-humidity products that help control hair for a frizz-free finish. Remember, your flat iron is a great tool to help you create sleek texture in a matter of minutes. Smoothing the hair cuticle allows your style to remain manageable and polished all day. Finish your look with serums containing Argan oil for added luster and protection. Sleek hair gets a bold color infusion in this high-contrast look that sparkles with high shine. Blow dry hair smooth with a paddle brush. Use a flat iron and do a lightly straighten all your hair. 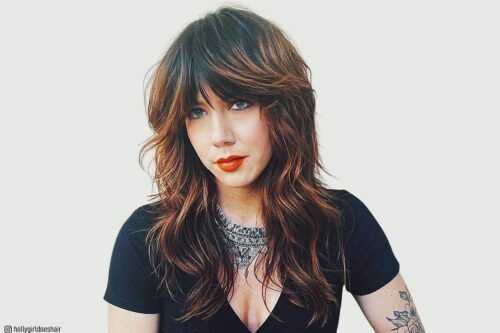 Keep the fringe full and bold to accentuate hair length. Lightly mist with shine spray. Try TIGI Bed Head Head Rush, a super fine mist that packs a shine adrenaline punch. This look is great for diamond and square-shaped faces. This style is perfect for medium to thick hair. Tip: Keep your hair color interesting and dimensional to create great movement. Espresso Brown gets a bold shot of crimson and copper for decadent drama. Apply lightweight mousse or styling foam to damp hair. Blow dry using a round brush. Spray hair with a light hold hairspray. Try Kevin Murphy Body Builder Volumising Mousse. Work that body and boost your hair with flexible fullness and hold. BODY.BUILDER can be used to define waves on just about any hair length, type or texture. It’s particularly effective on fine hair and hair that is dry or damaged. Tip: Style hair in a sleek ponytail for a chic, fashionable style. Sandy blonde hair needs extra conditioning love during warmer months. Blow dry hair using a paddle brush to smooth. Using a flat iron take large vertical sections and smooth. Allow to cool then lightly brush hair with a paddle brush. 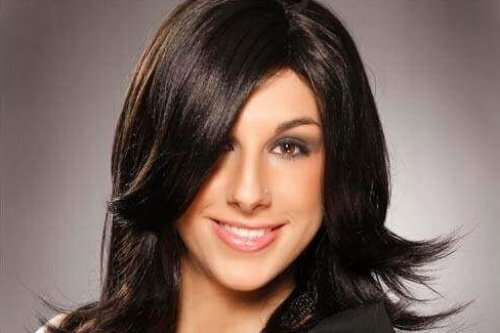 Style with a deep side part and apply a light wax to promote movement and separation. Try Davines Defining Wonder Wax. Works on all hair types to define and polish hair with long-lasting control and protection. It shapes, sculpts and sets styles with a light effect, leaving hair shiny with a natural touch. Tip: Try a center-part for a relaxed finish. Bold color panels come out to play in a swept back style. Blow dry hair smooth using a paddle brush. Backcomb crown area at the root to achieve a bit of height. Slick back sides and pin securly. Gently brush back fringe and crown area for a futuristic look. Spray with a hard hold hairspray for all day hold. Try Davines Defining Glam Power Hair Spray. This unique and versatile finishing spray shapes, defines and set any style. It also provides strong, long-lasting hold without that stiff or sticky feeling. Tip: Gather hair into a low ponytail or twist up in a chignon and pin securely. 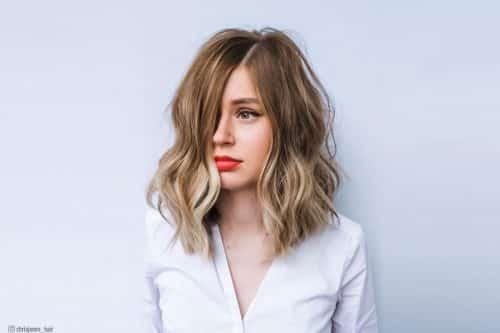 Delicious golden locks are smoothed to perfection in this easy hairstyle. 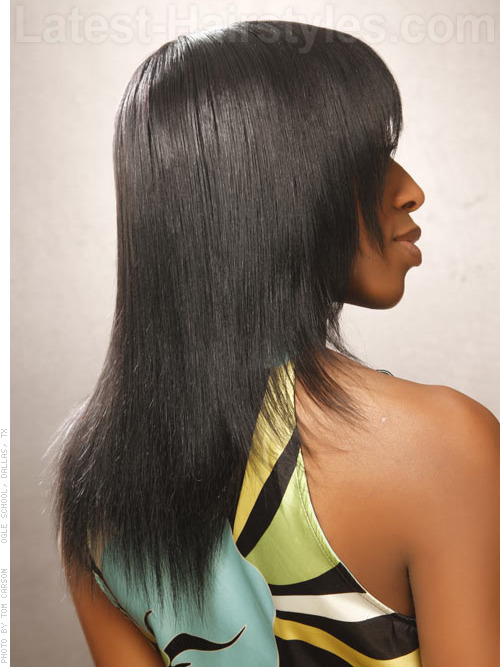 Use a flat iron and lightly smooth hair. Apply a light serum to protect ends. Try Rusk Deepshine Oil. This marine mineral-enriched argan oil treatment smoothes the cuticle, eliminates frizz, and improves elasticity and hydration. Ultimatel leaving hair soft, silky and manageable. This look is best suited for diamond or heart-shaped faces. This style works best on medium hair. Tip: Keep ends healthy by getting frequent trims to eliminate split ends. 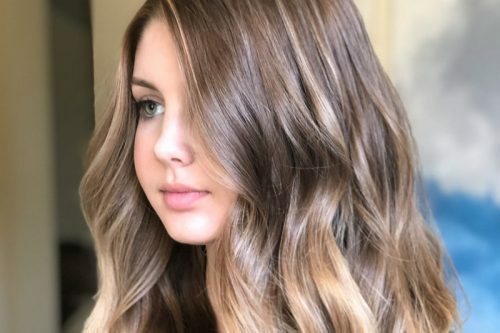 Brunettes get the best of both worlds with this brown to golden blonde ombre look. Spray hair all over with hairspray. Try Kevin Murphy Session Spray. Delivers a flexible finish and hold that will shine like a gloss product, holding hair in place without stiffness. This look is suitable for oblong and square shaped faces. This style works best on medium to thick hair. Tip: Back comb root area before flat ironing for an extra body boost. This rich red hue is perfectly balanced by this simple cut with a sleek finish. Dry hair using the blow dryer and a round brush. Using a flat iron take small horizontal sections and smooth. Allow hair to cool and brush out with a paddle brush. Spray with a light hold hairspray. Try Moroccan Oil Treatment. An ultra-light formula that is absorbed by the hair instantly, resulting in a natural, silky finish and brilliant shine without leaving a residue. This look is best suited for round or square faces. This style works best on medium to thick hair. Tip: Keep your color fresh with a color-infused deep conditioner for a double-duty treatment. Create a bold statement with this full, stylish fringe that’s totally on-trend. Dry hair using a blow dryer and round brush. Use a flat iron and smooth hair all over. Try Kevin Murphy Session Spray. This hairspray delivers a flexible finish and hold that will shine like a gloss product, holding hair in place without stiffness. This look is suitable for most oblong, round or square-shaped feaces. This style works best on thick hair. Tip: Style hair into high ponytail keeping fringe full. Try this Reese Witherspoon-inspired hairdo that will have you seeing stars. Apply a lightweight volumizing mousse to damp hair. Dry hair using a round brush and blowdryer. Keep the fringe long and wispy for a modern finish. Try Davines Defining Invisible Paste. Gives invisible impact to sculpt your hair. Builds volume & texture and adds shine & hydration. Leaves you a chic hair style with long lasting effect perfect for fine hair. This look is most suitable for heart shaped faces. 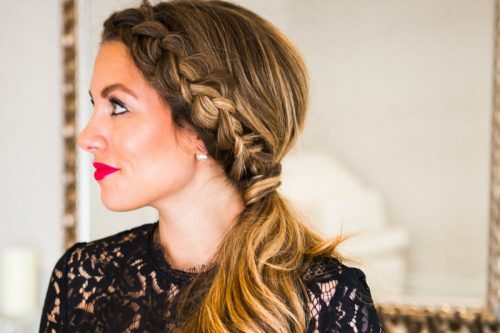 This style works best on medium hair. Tip: Use a flat iron to create a high shine finish. Sleek jet-black hair gets soft, subtle contrast with razored fringe and face-frame. Dry hair using a paddle brush and your blow dryer. Using a flat iron, smooth hair all over toward face.. Tip: Flip ends out with flat iron for a fun, flirty finish. Wearing long hair in a sleek style is super easy. It’s not only easier on your hair but easy on you too. While curling hair can be a bit time consuming, smoothing locks can happen in a matter of minutes. These trendy, fashionable styles can be worn loose or styled into cute ponytails for modern fun.